Kirsten Dunst's appearance on CBS' The Late Show with David Letterman has been rescheduled for Thursday. Dunst, who is reprising her role of Mary Jane Watson in Spider-Man 2, originally was scheduled to appear on Friday. She will be promoting her new film, Mona Lisa's Smile. * The first film is part of a stunt on Cinemax for Christmas Day. The cable network is holding a vote, with the top film airing at 10 p.m. Spider-Man is going up against Men in Black II, Catch Me if You Can, Ocean's Eleven and Minority Report. Viewers can vote at www.cinemax.com. * Sources told The Continuum that the new Spider-Man 2 trailer will show Doctor Octopus using his tentacles in full force and that the character, played by Alfred Molina, comes off more menacing and effective as a villain than the Green Goblin did in the first film. The trailer will be premiered online on Monday and then attached to Lord of the Rings: Return of the King. Hurricane Entertainment is entering a new realm for comics with its John Carpenter's Snake Plissken Chronicles title. On Dec. 16 a two-disc Collector's Edition DVD of Escape from New York will hit stores. Included in the set is an exclusive DVD sized copy of issue #1 of the current Snake Plissken story arc. This custom comic edition contains a vellum pull-out with brand new and unseen art from Snake artist Tone Rodriguez. The first vellum contains a pencil and charcoal portrait of Kurt Russell as Snake. The second vellum is Tone's personal rendition of the classic 1981 Escape movie poster. This tribute appears directly above the printed signatures of John Carpenter, Debra Hill and Kurt Russell and those of Snake writer William O'Neill and artist Rodriguez. "Our goal is for fans of the film to discover their hometown comic book store and pick up the remaining three issues of this Snake Plissken story arc." "Or, quite frankly, any comic book, by any comic book publisher. We believe the rising tide raises all ships," said William O'Neill, "Most people who have never been inside a comic book store have no idea of the enormous variety of stories and genres available. With this DVD release we have the potential to eventually reach over half a million new readers. With a cliff hanger ending in issue #1 DVD fans will have to seek out a comic book store to find out what happens next. Imagine if just ten percent of these folks do just that." Bonus material on this DVD includes a pictorial journey entitled "Making of John Carpenter's Snake Plissken Chronicles Comics" that includes a behind-the-scenes look at Hurricane Studios production process, from conception to release. John Carpenter's Snake Plissken Chronicles #3 will reach stores on Wednesday, with #4 scheduled for a January release. Actor/rapper Coolio at last will be featured in the Daredevil movie, when a Director's Cut edition is released on DVD in April. Coolio plays a character named Donte Jackson, but his scenes were cut in the movie's theatrical form. 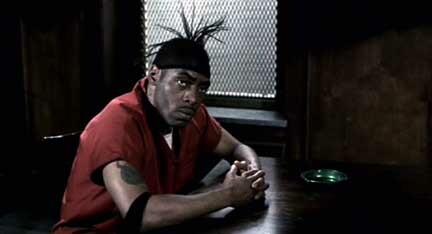 "I was on trial for a murder I didn't commit and he (Matt Murdock) knew I didn't do it and represented me," Coolio told The Continuum about his role. "I had a lot of fun doing it. Ben Affleck is cool." "He was actually quite good," Daredevil director Mark Steven Johnson said. "But the subplot involving his character got cut." Coolio's character appeared in the first teaser/trailer for the film and was even included in Topps' trading card set. 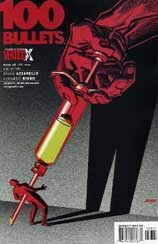 With Powers #30, creators Brian Michael Bendis and Michael Avon Oeming forever altered the status quo of their superhero crime drama, published by Image Comics. Over the next seven issues, they provided readers to a brief history of the Powers universe, but now they're ready to unveil the next stage of the series' development: Powers, Vol. 2 will launch as an all-new series this March. 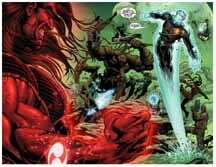 "After one of the world's most powerful superheroes unhinges, destroying entire cities in his wake before finally destroying himself, the President of the United States declares all Powers illegal," Bendis said. "In the new Powers number one, we follow homicide Detective Deena Pilgrim back to work after a lengthy sick leave. We are taken on her tour of the new world of Powers, where all Powers are illegal, a world without heroes and a world almost cracked in half by super-powered villains run amok and unchallenged. So essentially, this is a whole new chapter in the Powers saga, making the new number one completely thematic." Bendis said he hopes his popularity because of his work on Marvel titles rubs off on Powers. 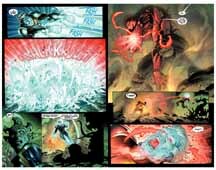 "Having entered the convention circuit again after a lengthy absence it was amazing how many of my die-hard Daredevil and Ultimate Spider-Man fans were not aware that i was the writer of Powers," Bendis said. "Once they found out, they'd buy the entire library of trades right off the table, so clearly, we needed to get the word out that Powers is not only one of my titles, but that it is a totally unique comic book experience or fans of superheroes or crime comics." Said Oeming, "This really is a perfect place to step into the Powers world! If you've been wondering what this is all about, now is your chance to find out!" The bulk of the series -- Powers #1-30 -- has been collected in six trade paperbacks, and the seventh installment (the "history lesson" from issues 31-37) is currently planned for an early summer release. Powers Vol. 2 #1 is scheduled to be in stores on March 24. Retailers who purchased a minimum number of copies of Image Comics' Frankenstein #1 by Mark Wheatley will be getting a bonus from Wheatley and cover artist Adam Hughes. 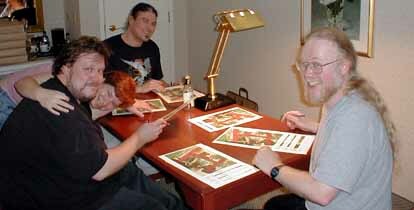 At the Mid Ohio Con, Hughes and Wheatley spent the better part of a night signing 1,500 copies of an exclusive art print of Hughes' cover image for his cover to Frankenstein Mobster #0. The 9" x 12" print is on extra heavy art stock, allowing a very rich printing of Adam's movie poster style illustration. The print was shipped from the printer in Hong Kong just in time for the signing session at the Mid Ohio Con. �Retailers who qualify will have the print before Christmas. Retailers are free to keep the print or offer it for sale at any price they feel is reasonable. "If you've ever been wondering what the difference is between high-speed, mass-market printing and art printing, this is a perfect example," said Wheatley. "I think we are getting top quality printing on the Frankenstein Mobster comics, but the art print is 50 percent more intense and dramatic. "Diamond Comic Distributors and Image have gone the extra mile to see that this Holiday Gift event can make some fans and retailers happy." Taking the holiday spirit a step further, Wheatley is giving away pages of original artwork from issue #1. Random copies of the FM #1 issue will have elaborate, large stickers attached to a page of the story. �The fan who purchases a stickered copy will find special instructions that will result in getting signed copies of the comic book as well as the original art by Wheatley for the page that is stickered. Retailers will have the chance to get an original as well, as the sticker instructions give details on how the fan should include store information when contacting Wheatley. A total of five pages of original art will be given away. Negation #25 will arrive in stores on Wednesday from CrossGen Entertainment. The issue is writen by Tony Bedard, penciled by Paul Pelletier, inked by Dave Meikis and colored by Laura Martin. "On one side you have Javi, acolyte of the mad god Charon...and mega-charged engine of destruction. On the other you have Obregon Kaine, leader of a rag-tag group of freedom fighters...and without an once of superhuman power. But between Obregon's military instincts and his team's will to fight, Javi and his strike force will learn the oh-so painful lesson that sometimes the difference between defeat and victory is the desperate willingness to do whatever it takes to win." Negation #25 will be 32 pages and will cost $2.95. Click on the thumbnails for larger images. Capcom artist Shinkiro is providing the cover art to Marvel Comics' Spider-Man Unlimited #1 in January. "I am honored that an artist as revered and respected as Shinkiro has agreed to illustrate the first cover for Spider-Man Unlimited #1," said Marvel's talent coordinator C.B. Cebulski. "I owe many thanks to our friends at Capcom Co. Ltd. for making this happen. We could not be more pleased with the beautiful cover that Shinkiro-san has so masterfully rendered. "However, I would also like to express my sincere apologies to Shinkiro-san and Capcom Co. Ltd. for a slight blunder on Marvel's part," Cebulski continued. "When we solicited the book, we ran a pre-production image of the cover that Shinkiro-san had not yet completed. While it was clearly labeled 'NOT FINISHED ART,' this message was not imbedded in the image itself. This incomplete image was then mistakenly released to the Internet community, but it was not noted there that this was an unfinished piece. It was only after the piece had gone out that we realized our mistake. "I feel terrible about this. We've done a great disservice to Shinkiro, his art and his reputation by releasing a piece of his unfinished art. Marvel is going to do everything in its power to correct the mistake and see that the actual finished Spider-Man Unlimited #1 cover is distributed through the proper channels and give it the exposure it so rightfully deserves. Again, Marvel's apologies for this error go out to Capcom Co., Ltd. and Shinkiro. We look forward to continuing our strong relationship with them, as well as expanding it to get other Capcom artists working on Marvel comics." Spider-Man Unlimited #1 goes on sale on Jan. 7. American Splendor will be released on DVD on Tuesday, Feb. 3. Upcoming episodes of NBC's Tutenstein include "The Curse Of The Pharaoh" on Saturday, Dec. 13 and "Clash Of The Shabtis" on Saturday, Dec. 20. * For Wednesday, Dec. 3, including DC news, CLICK HERE. * For Tuesday, Dec. 2, including Teen Titans news, CLICK HERE. * For Monday, Dec. 1, including X2 movie news, CLICK HERE. * For Saturday, Nov. 29, including Hellboy movie news, CLICK HERE. * For Friday, Nov. 28, including X-Men: Evolution news, CLICK HERE. * For Thursday, Nov. 27, including Transformers news, CLICK HERE. * For Wednesday, Nov. 26, including Justice League animated news, CLICK HERE. * For Tuesday, Nov. 25, including X2 movie news, CLICK HERE. * For Monday, Nov. 24, including Marvel Comics' solicitations for February, CLICK HERE. * For Sunday, Nov. 23, including Hellboy movie news from Wizard World Texas, CLICK HERE. * For Saturday, Nov. 22, including the DC Comics and Devil's Due panels at Wizard World Texas, CLICK HERE. * For Friday, Nov. 21, including IDW Publishing's solicitations for February, CLICK HERE. * For Thursday, Nov. 20, including Image Comics' solicitations for February, CLICK HERE. * For Wednesday, Nov. 19, including DC Comics news, CLICK HERE. * For Tuesday, Nov. 18, including DC Comics' solicitations for February, CLICK HERE. * For Monday, Nov. 17, including Astro Boy news, CLICK HERE. * For Saturday, Nov. 15, including Wonder Woman news, CLICK HERE. * For Friday, Nov. 14, including Punisher movie news, CLICK HERE. * For Thursday, Nov. 13, including Image Comics news, CLICK HERE. * For Wednesday, Nov. 12, including Smallville news, CLICK HERE. * For Tuesday, Nov. 11, including Tomb Raider news, CLICK HERE. * For Monday, Nov. 10, including Punisher movie news, CLICK HERE. * For Saturday, Nov. 8, including DC news, CLICK HERE. * For Friday, Nov. 7, including Dark Horse solicitations, CLICK HERE. * For Thursday, Nov. 6, including Smallville news, CLICK HERE. * For Wednesday, Nov. 5, including DC news, CLICK HERE. * For Tuesday, Nov. 4, including DC news, CLICK HERE. * For Monday, Nov. 3, including Punisher movie news, CLICK HERE. * For Sunday, Nov. 2, including the DC panel at Las Vegas, CLICK HERE.